FFCR is located in beautiful Ramona California. I started my rattery in April 2009, with the GOAL to create friendlier and healthier rats. Also to breed beautiful rats in all my favorite varieties. My rodents will ALWAYS be my pets first and foremost. I AM PRIVATE WITH MY RODENTRY. 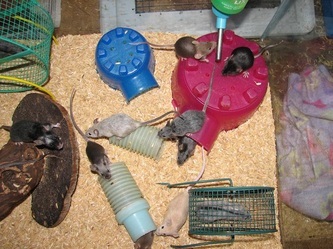 I BREED TO IMPROVE THE FANCY, I DO NOT WANT TO BE IN THE POLITICS OF THE RODENT BREEDING WORLD. I WILL NOT BUY INTO SLANDER. 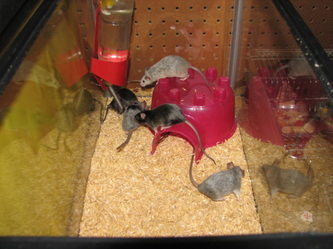 I LOVE MY RATS AND WORK FIRST TO PLEASE THEM, THEN SECOND TO PLEASE PEOPLE. 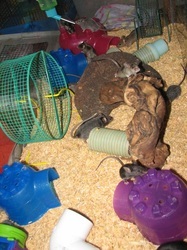 I CAN PROVIDE YOU A FRIENDLY, HEALTHY AND HAPPY RAT. IF YOU CHOOSE TO BELIEVE SLANDER, SO BE IT. FOR THOSE OF YOU THAT CHOOSE FOR THEMSELVES, THANKYOU. Hello. My name is Shuron. I am 22 years old. I Love animals and have had almost every kind of animal there is. 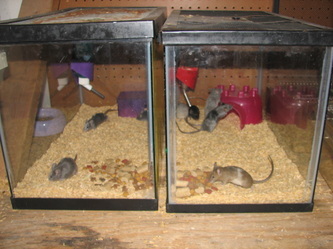 I have had rats since I was 5 years old and mice for about 5 years now. I am a new mother of a beautiful 3 year old baby girl. I am engaged. I Have been riding horses for 12 years now. I recently had to part with both of my horses though. 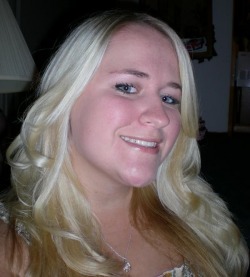 I work as a dog groomer at Doggies Divine and love what I do! I could not imagine myself doing a job that did not involve animals. I live in Southern California and have all my life. I moved to Lakeside when I was about 14 and on November 1st 2011 I moved to Ramona. Ramona is very historic and beautiful. Its more rural with a western feel and I just love it! Well, that is me in a nut shell. I hope you enjoy my site and if you want to know anything more about me, just send me an email. 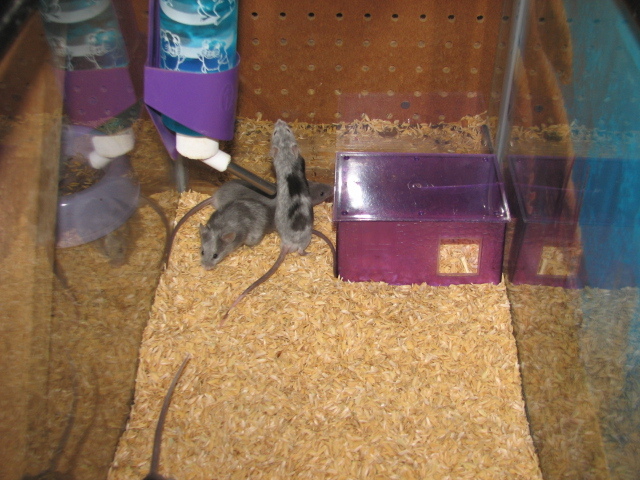 I breed merle rats. My goals for this line include continuing to improve type and improve personality as well as Make the rats bigger and create beautiful show quality merle ratties. 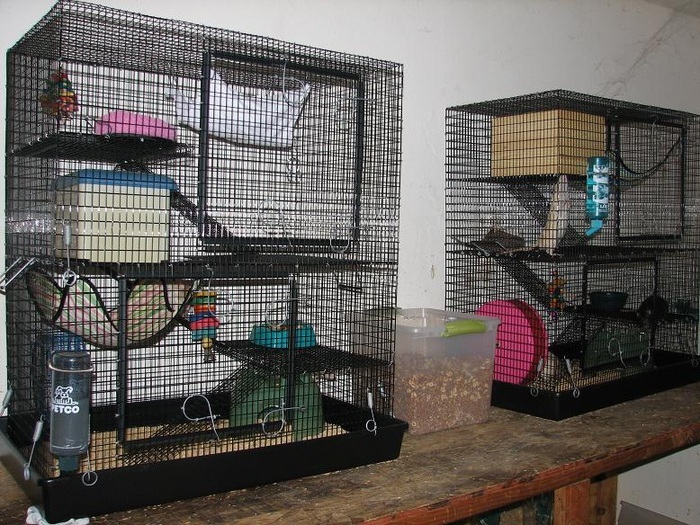 I will be working for a healthier more friendly rat with great type and something that fits AFRMA show standards. 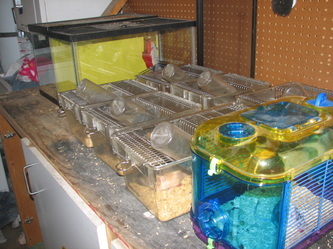 I am currently breeding merle mice, roan mice as well as banded and dove agouti. I have standard and satin coat types in many different colors. My lines all have different goals and focuses but all in all I am working to create a more laid back, more beautiful mouse. 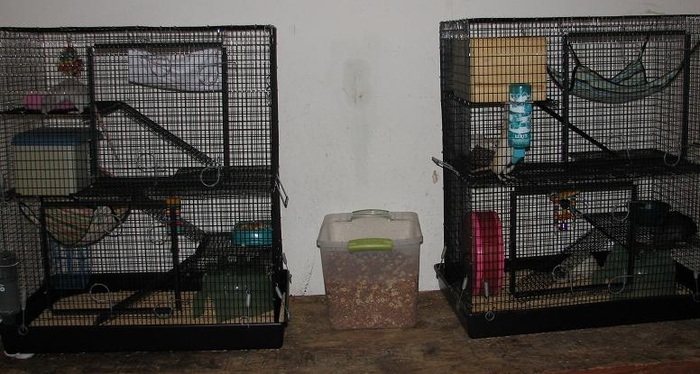 This is my male cage. It is a Martins R695. 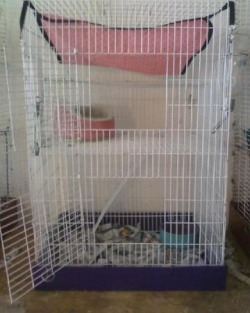 Its huge and the boys LOVE it! It has one hammock, a bed, an igloo, a crinkle tunnel and has just had a box house, wheel and hanging wood chew toy added that are not pictured. 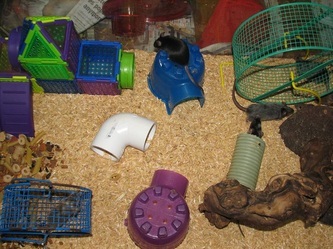 This is the female cage. It is a HUGE martins R695 and the girls LOVE it! 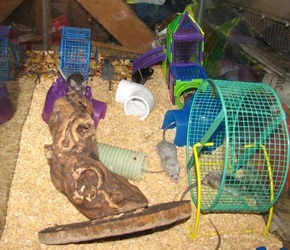 It has 2 hammocks, a pink bed, a large igloo, a box house, a wheel and some hanging wood chew toys. 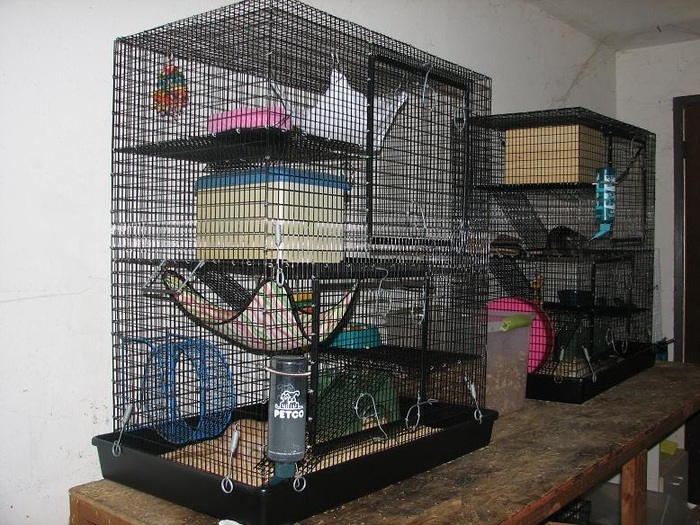 I love this cage and so do the girls! This is my Extra cage. I put the rats in it while I clean their cages. It also can be used as a quarantine cage or what ever else I need it as. 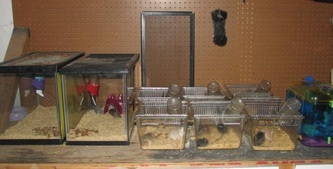 This is a section of my female mouse cage. its a lot bigger than it appears.